Photo: Children of our native team are happy to bring home bananas from a recent harvest at our existing banana grove. February 9, 2018. 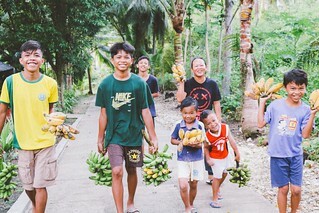 Today we bring you a good report from our native team on the island of Cebu, Philippines: we recently utilized an unused portion of our land to plant a new banana grove, and we are hopeful that these young banana trees will grow, flourish, and provide a bountiful harvest by the end of this year. This is in addition to our first banana grove which currently contains 128 banana trees. A typical banana harvest yields about 6 large stalks of bananas — an average single bunch yields a profit of $6.00 which quickly adds up since we harvest bananas weekly. It may not sound like much but in the local economy $36 equals several days’ wages. In other good news, we recently harvested 200 fish from the large pond in our fishery at the end of January. On-demand sales continue to yield steady profits from this program, which is a positive result of making a change to our sales plan. Instead of doing mass harvests to sell at market, we are now selling smaller harvests on demand to families and smaller vendors. However, our fishery has suffered some damages in that the small pond structure has many cracks — thus, there are no fish in the small pond at this time. With your support, we are seeking to raise $425 to purchase sand, cement, and a water-proofing chemical in order to repair the small pond structure and get our fishery back up and running at its full potential. We are also happy to report that our hen house project continues to operate successfully, an integral part of our farmland enterprise. We currently have 231 hens and egg production is at optimal levels — our hens are currently laying an average of 190-200 eggs per day. There is such a high demand for fresh eggs from local neighbors that our native team has been selling them on a wait listed basis directly to the consumers every day. In addition, we have 11 goats living on our goat farm, which we plan to sell at market for an approximate profit of $87. We also have 2 adult pigs and 2 piglets living in our piggery which we expect to yield a profit of $222 when we sell them at market. Along with your generous support, our farmland projects will help with some of our funding challenges, providing more profits to help at-risk children and orphans succeed in school. 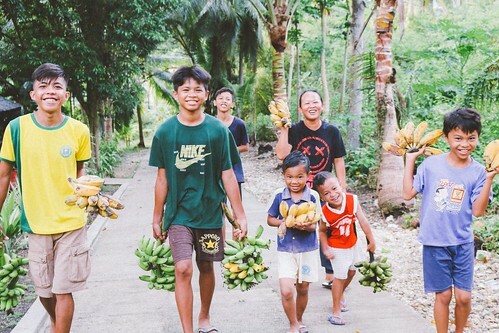 We currently have 40 children enrolled in our Children’s Hope Center on the island of Cebu — they are studying English, science, math, social studies, and religion in school. The 5 girls living at our Girls Home are also currently enrolled in school where they are studying English, science, math, social studies, music, art, physical education, and health. All of our children and the girls passed their exams this month with excellent scores, which made them very happy and thankful. Our programs are helping to keep girls and children successfully enrolled in school, which is especially important for the girls at our Girls Home, who were severely at-risk before our programs intervened in their lives. In 2001, it was estimated there were 10,000 young girls trafficked into slavery in Cebu. Then it was reported in 2009 that Cebu remained a destination, source, and transit area for human trafficking where victims are brought to be “processed” before being sold in the Philippines and other countries into lives full of danger, suffering, and despair. We are so thankful for your prayers and support which enable us to continue to bless and transform the lives of our children and to break the tragic cycle of poverty and slavery. * Names are changed to protect our program beneficiaries.